Like most of my hand made sheaths the Mora Carbon sheath is born out of a lack of options. The original Mora Carbon sheaths are OK but everyone has one and they seem to lack a leather one as standard supplying only a mass produced Kydex version. After market sheaths are also 2 a penny but very expensive. For those of you that want a leather sheath that isn't the Mora standard but don't want to pay literally hundreds of beer vouchers for it my sheath is one of few choices! A simple leather sheath for your Mora Carbon. Available in both natural treated leather or brown treated leather. This sheath will protect your Mora Carbon for many years. 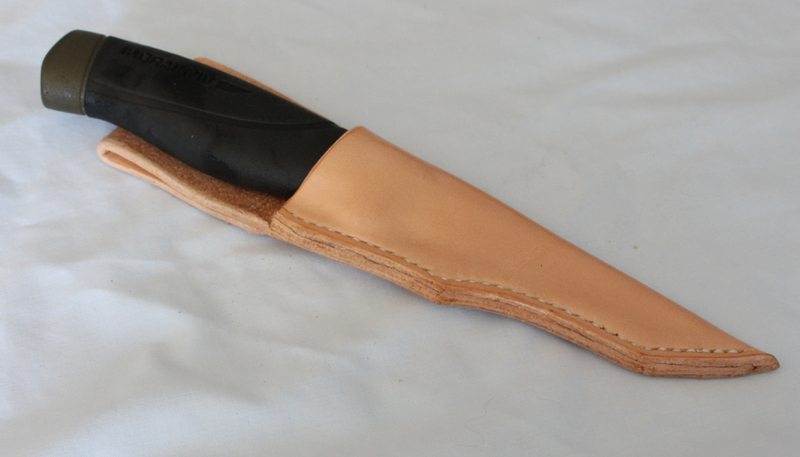 This sheath will fit most of the Mora Bushcraft style blades providing the handle does not have a finger guard.